PJ Murphy has been delivering unrivalled recovery and breakdown solutions across County Tipperary and beyond – predominantly along the M8 motorway - for three decades. We dropped into his base at Thurlesbeg, Cashel to find out more about the history of his exceptional operation, the range of services provided and the superb fleet of recovery vehicles he operates. As the name suggests, PJ Murphy Recovery, Roadside Rescue & Breakdown Services provides a complete range of recovery solutions. The eponymous PJ has been specialising in recovery since the mid-‘80s and he offers a thoroughly-professional, punctual and dependable service, 24 hours of the day, seven days per week. From his Cashel base, he is particularly synonymous with the stretch of the M8 motorway that runs from Junction 4 Urlingford to Junction 8 Mitchelstown, although his excellent services are extended to all routes in the Premier County (especially within a 25km radius of Cashel town), if and when required. PJ works with all the major roadside rescue companies - including AA Roadside Rescue, RAC Rescue, Motor Insurance Services (MIS), Crash Services NI, Aria and Mapfre – and also provides breakdown / recovery services for all of Ireland’s main insurance companies. Ideally located just five minutes off the M8 on the outskirts of Cashel, PJ owns and operates the latest specialist equipment for the safe and efficient recovery of all types of motorcycles, passenger cars and light commercial vehicles, including those equipped with automatic transmissions and vehicles with low suspensions. PJ has certainly come a long way in the past 29 years. From modest beginnings, he has established a stellar reputation as the premier breakdown / recovery specialist along the M8 around the Portlaoise, Abbeyleix, Durrow, Urlingford, Cashel, Cahir, Tipperary Town, Thurles or Clonmel areas. PJ has never looked back. Mind you, this was no overnight success story. In this line of work, you’ll only get back what you’re prepared to put in. To this end, a lot of long hours have been invested in developing and growing the business. It takes years to develop the sort of reputation for excellence that PJ Murphy Recovery, Roadside Rescue & Breakdown Services now carries. The nature of recovery is that you have to keep the mobile phone fully charged and switched on day and night; be prepared for any eventuality; invest in the best equipment and be able to safely and professionally operate it. At the end of the day, recovery is essentially an emergency service and operators have to have their heads screwed on at all times. “I’m on call 24/7, 365 days a year,” PJ confirms. “You have to be ready to work at any time, day or night, because when people call you they are really depending on you to get them out of trouble. You have to be prompt and you have to make sure you have everything that’s needed to safely remove the vehicle – and, if required, its occupants – from the road or roadside. 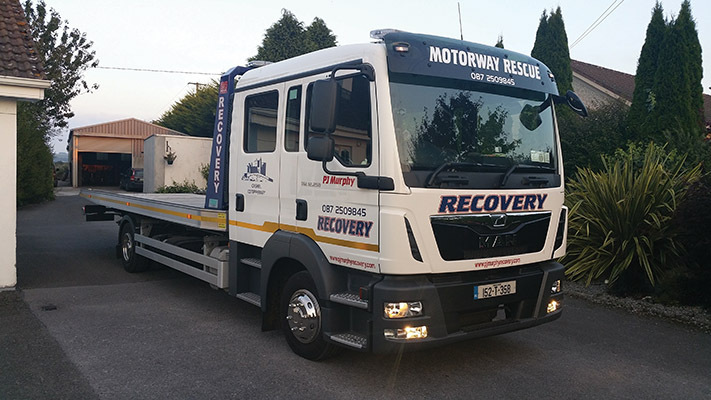 The success of PJ Murphy Recovery, Roadside Rescue & Breakdown Services has been achieved by providing a great service and using the best possible equipment. There’s no trade secret or rocket science at work here. A combination of hard work and customer care have seen PJ carve out a niche for himself in this vital sector. With a magnificent track record of providing excellent breakdown/recovery services over the past 29 years, PJ Murphy Recovery, Roadside Rescue & Breakdown Services is in a strong position going forward. One gets the distinct impression that there are a few chapters yet to be written in this particular success story!